We've added The Q Source Resource blog to our company Web site. You can view it here. We aren't abandoning our Blogger blog, but will be posting to both sites on different schedules and with different content. All current content on our Blogger site will remain on the site. Thank you for your attention and for being a Q Source Resource reader/subscriber. You may also contact us via email or phone (800-966-6020) for large orders or other inquiries. We also offer live chat customer service on our Web site. Q Source Web Accounts Offer a Variety of Benefits & Features - Create Yours Today! Creating a Web account on QSource.com is quick, easy, and full of benefits. Read on for more details, or if you're eager to get started, head over to our site and click on "My Account." From the Q Source homepage, click on "Click Here To Log In" or on the "My Account" link. If you are already logged in, you'll see your name and account ID instead of "Click Here To Log In." On the Log In screen, click on "Sign up" if you don't have an account. If you already have an account, enter your username/password and click "Log in." 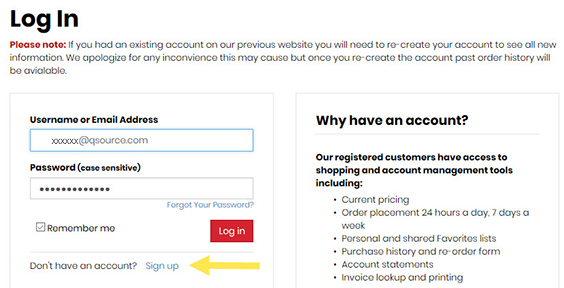 Please note: If you had an account on our old Web site, you'll need to create a new account on our new, current site. We will then combine the two accounts for you. Once you've logged into your account, you'll see a variety of useful options on your My Account page. At the top of the page, you'll find quick access to current or recent orders. Clicking on an order number brings you to info about that order and also offers a quick reorder option. Your My Account page also offers you access to helpful Shopping and Account Tools. These sections were designed to offer you complete control over your account and shopping preferences. Shopping Tools provide quick access to Wish Lists, Saved Carts, Search History, and more. Accessing your favorite products and previous shopping habits is fast and easy. Account Tools let you change various account settings, view quotes, review statements and shipments, and more. If you need information about open or past orders, this is where to find it. As the old expression goes, membership has its benefits. 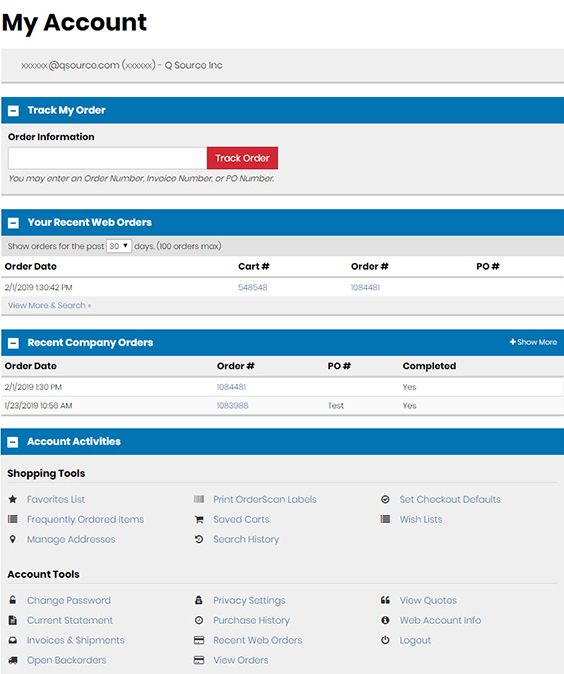 Having a Q Source Web account provides quick and detailed access to your account info and faster ordering of frequently purchased items. To get started, either Create an Account or Log In. Happy Shopping! If you require further information, please call us (800-966-6020), email us, or start a chat on our Web site. We're happy to assist you. ASG’s Free Power Supply promotion is a long-running, popular special offer. The current version of this promo is expanded to include more eligible products. This promo expires on December 31, 2019. Cannot be applied to previous purchases. When you purchase one of the eligible ASG HIOS or TL Electric Screwdriver (see below for chart) you’ll receive a Free Power Supply. Eligible drivers include A Series, BL Series, BLG Series, CL Series, SS Series, SSCR Series, and TL Series. 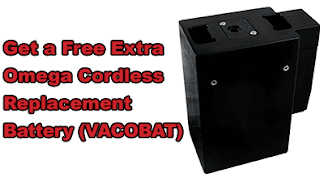 Free power supplies include the PS-55, T-70BL, CLT-60, and CLT-80. 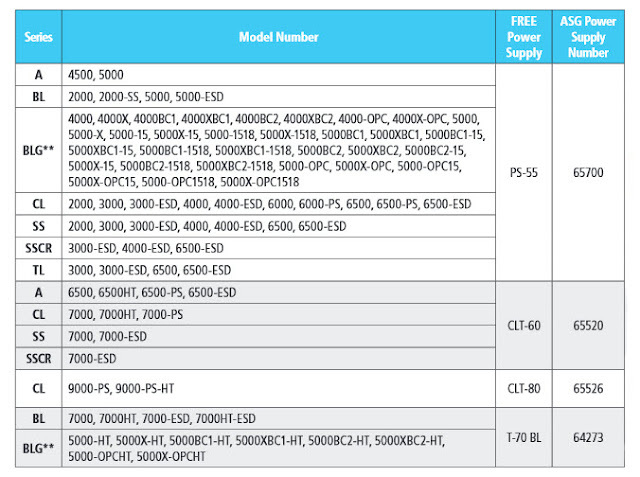 BLG-OPC models require either the purchase of the BLOP-SC1 (ASG #65590) or BLOP-SC3 (ASG #65591) counter with the order to receive a Free Power Supply. For part numbers 64106-A019, 64107-A019, 64109-A019, 64110-A019, 64111-A019, 64112-A019, 64113-A019, 64116-A019, 64118-A019, 64120-A019, 64121-A019, 64134-A019, 64200-A019, 64257-A019, 64268-A019, 64271-A019, 64275-A019, 64280-A019, 64281-A019, 65512-A019, 65601-A019, 65602-A019, 65605-A019, 64291-A019, 64292-A019, 64293-A019, 64294-A019, 65525-A019, 64285-A019, 64277-A019, 64286-A019, 64287-A019, 64278-A019, 64279-A019, 64288-A019, 65500-A019, 65501-A019, 65560-A019, 65561-A019, 65563-A019, 65565-A019, 65562-A019, 65583-A019, 65585-A019, 65582-A019, and 65584-A019 use Coupon Code ASGFREEPS55 to get the PS-55 Power Supply. For part numbers 64117-A019, 64126-A019, 64129-A019, 64269-A019, 64284-A019, 64295-A019, 64136-A019, 64289-A019, 64125-A019, and 64124-A019 use Coupon Code ASGFREECLT60 to get the CLT-60 Power Supply. For part numbers 64138-A019 and 64139-A019 use Coupon Code ASGFREECLT80 to get the CLT-80 Power Supply. For part numbers 65504-A019, 65505-A019, 65506-A019, 65570-A019, 65569-A019, 65589-A019, 65587-A019, 65579-A019, and 65578-A019 use Coupon Code ASGFREET70BL to get the T-70 BL Power Supply. To get your FREE power supply for the BLG models (65572-A019, 65571-A019, 65573-A019, and 65575-A019), please contact us directly at qsales@qsource.com or 800-966-6020. 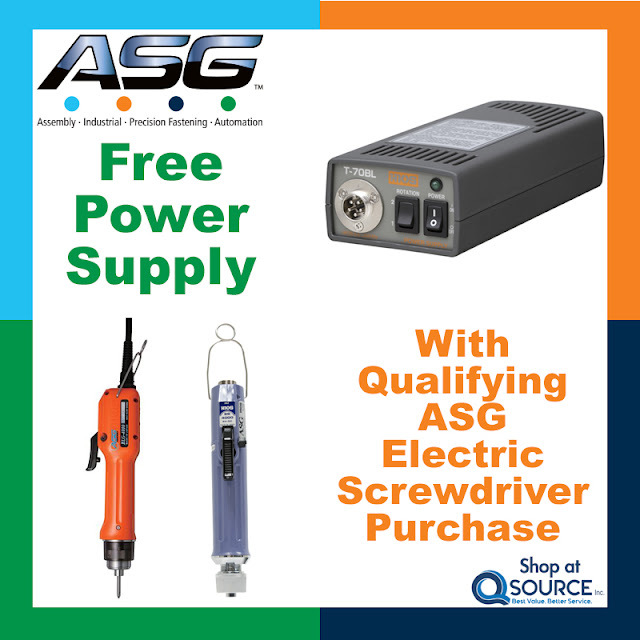 Please visit our ASG Free Power Supply promo page to purchase ASG Electric Screwdrivers and get your Free Power Supply. You may also contact us via email or phone for large orders or other inquiries. We also offer live chat customer service on our Web site. During this dry time of year, static is an ever-present danger. It’s EVERYWHERE! Static control specialist, ACL Staticide®, is offering a great way to fight that static now AND save money doing so. Running through April 30th, buy 3 of either their 2006-4 Static Sentry or their 8660-4 Freeze Spray Anti-Stat aerosols and get 1 free. These promo-specific part numbers will get you 4 cans for the price of 3. 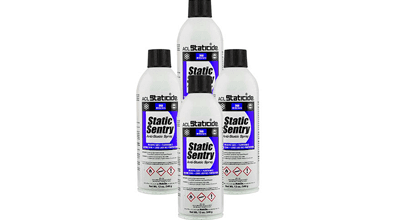 ACL Staticide's Static Sentry Anti-Static Spray instantly eliminates charge generation on porous and non-porous materials, while inhibiting tribogeneration. It is also Ozone-safe, minimizes system errors and downtime, prevents dust attraction on plastics, and removes static attraction on garments. Use Static Sentry on a variety of surfaces including laminate flooring, carpeting, work surfaces, plastics, and glass. It is safe to use in manufacturing facilities for static control on carrying trays, protective packaging, and smocks. 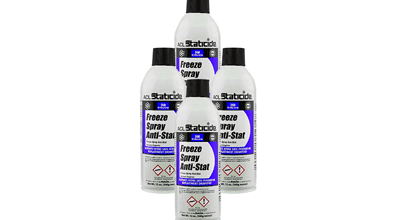 ACL Staticide’s Freeze Spray Anti-Stat is a non-flammable, Ozone-safe, high-performance freeze spray that provides pinpoint accuracy and safe cooling for static-sensitive components. It utilizes an instantaneous freezing material that leaves no residue, is safe on plastics and sensitive surfaces, and has an anti-static formulation. Use Freeze Spray Anti-Stat for locating thermal intermittent electrical components and cooling printed circuit boards with minimal static generation. It’s ideal for dissipating heat in rework and repair operations and cooling hot components and boards for stress fracture and crack testing. Visit our ACL Staticide Buy 3, Get 1 Free Promo Page to take advantage of this can’t-miss, limited-time offer. You may also contact us via email or phone (800-966-6020) for large orders or other inquiries. We also offer live chat customer service on our Web site. The JBC NASE-1C NANO Premium Series ESD-Safe 120V Digital Soldering Station was designed for micro soldering and desoldering of small-size components like 0201 & 0402 chips, etc. This complete station includes the Nano Soldering Iron NT205-A and Nano Tweezers NP105-A, which allow you to work at the highest precision because they are the lightest, tiniest, and most ergonomic on the market. The control unit is fully compatible with both tweezers or irons. 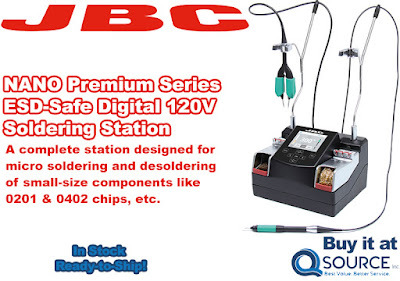 Visit our JBC Tools NASE-1C NANO Premium Series ESD-Safe Digital Soldering Station page at QSource.com to purchase this complete soldering/desoldering station. Check out our JBC Soldering page for additional products. You may also contact us via email or phone (800-966-6020) for large orders or other inquiries. We also offer live chat customer service on our Web site. 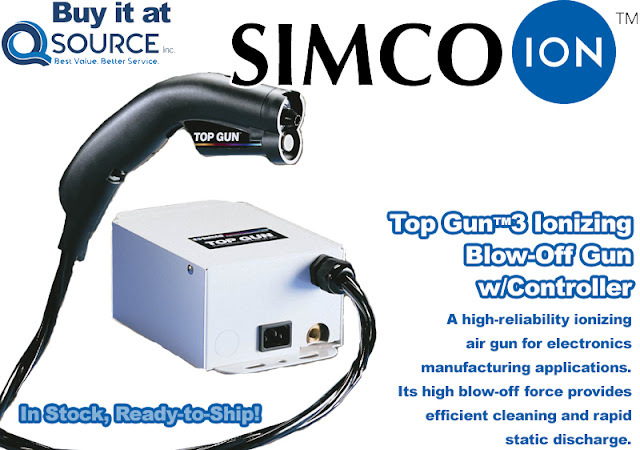 The Simco 4006599 Top Gun™3 Ionizing Blow-off Gun is a high-reliability ionizing air gun for a variety of electronics manufacturing applications. 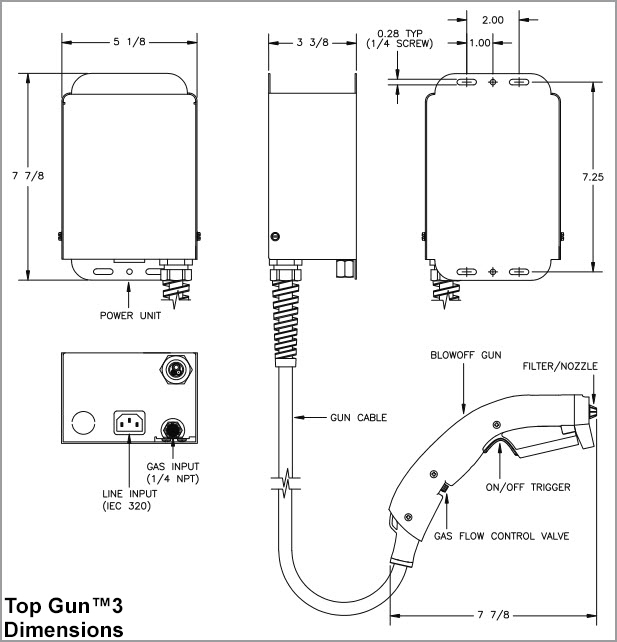 The Top Gun 3 features high blow-off force to provide efficient cleaning and rapid static discharge. The lightweight (less than 7 oz.) gun body is static-dissipative, durable, and features a light-touch trigger. All control functions are built into the gun for easy use. The Top Gun 3 is a forceful neutralizer and blow-off gun that easily removes stubborn particulate from surfaces and gets rid of troublesome charges responsible for the attraction of contaminants to product surfaces. The unit accepts both compressed air or inert gases, including nitrogen. For convenience and safety, the Top Gun’s cable is protected by a heavy vinyl-covered metal shielding. The power supply mounts easily above or below the worksurface. And the unit's "shockless" design prevents users from experiencing uncomfortable shocks if the ionizing point is touched. Visit our Simco-Ion 4006599 120V Top Gun 3 Ionizing Blow-Off Gun (w/Controller and 14' Cable/Hose Assembly) page at QSource.com to purchase your own Top Gun 3 (also available with a 7' cable as part number 4005105-01). Check out our Simco-Ion page for additional products. You may also contact us via email or phone (800-966-6020) for large orders or other inquiries. We also offer live chat customer service on our Web site. Get Free Ground Shipping and save an extra 10% on Transforming Technologies StaticCare™ GL2500 Series ESD Cut-Resistant Gloves at Q Source. Promo-eligible gloves are available in uncoated, finger-tip coated, and palm-coated versions and in extra-small, small, medium, large, extra-large, and double-extra-large sizes (sizes run small because they are meant to fit tightly for improved dexterity). Offer valid through April 15, 2019. 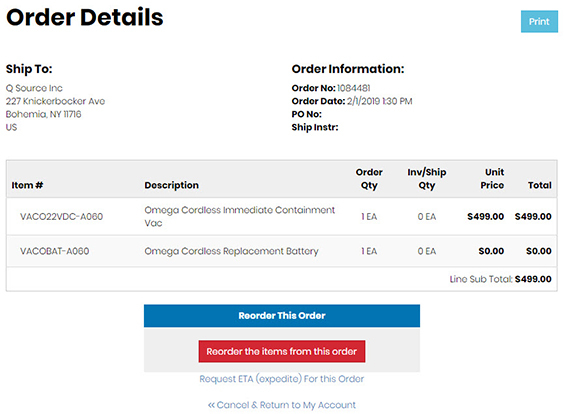 Add StaticCare gloves to your cart and you'll be able to select Free Best Way as your shipping method. Then enter Coupon Code TRANSTECHGLOVES10 to get your 10% discount. Please note: If purchasing non-promo products, in addition to the promo gloves, you will be charged shipping on only the non-promo items. Coupon Code must be entered to received extra savings. 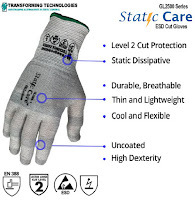 Combining powerful cut resistance, comfort, and uniform ESD protection, the superior-performing StaticCare ESD Cut-Resistant Gloves are certified ANSI Cut Level 2 while maintaining softness, flexibility, and comfort. The StaticCare ESD Cut Gloves are constructed with 18-gauge Ultra High Molecular Weight Polyethylene (UHMWPE) thread which provides great cut protection, outstanding abrasion and tear resistance. The gloves are rated ANSI Cut Level 2, which offers a basic level protection against cuts or punctures. 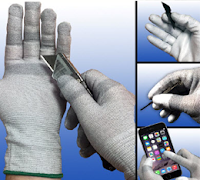 The StaticCare GL2500 series gloves provide superior ESD protection because conductive carbon threads are combined with the cut resistant fibers to provide uniform static decay rates. Typical surface resistance is less than 10^7 ohms per ANSI/ESD SP15.1. The ESD inspection gloves may be laundered for repeated use. A finished knit wrist-cuff has a snug fit that reduces glove slippage and keeps debris out. The uncoated finish version provides maximum breathability. To improve grip, polyurethane-coated fingertips and coated-palm versions are also available. Visit our Transforming Technologies StaticCare Gloves Promo Page to take advantage of this limited-time offer. You may also contact us via email or phone (800-966-6020) for large orders or other inquiries. We also offer live chat customer service on our Web site. Do you have an ESD process control system to detect ESD events within your facility? With our exclusive SCS ESD Event Detection promo, you can get 20% off regular prices on SCS’ diagnostic tools, which help you to verify that you are truly free of ESD events. Now, through March 31, 2019, save 20% on the SCS CTM082 ESD Pro Event Indicator, the SCS CTM048-21 EM EYE Meter w/ESD Sensor, and the SCS 770063 EM Aware Monitor w/Ethernet Output. No Coupon Code is necessary to get the 20% off savings. Prices shown are already discounted for the promo. 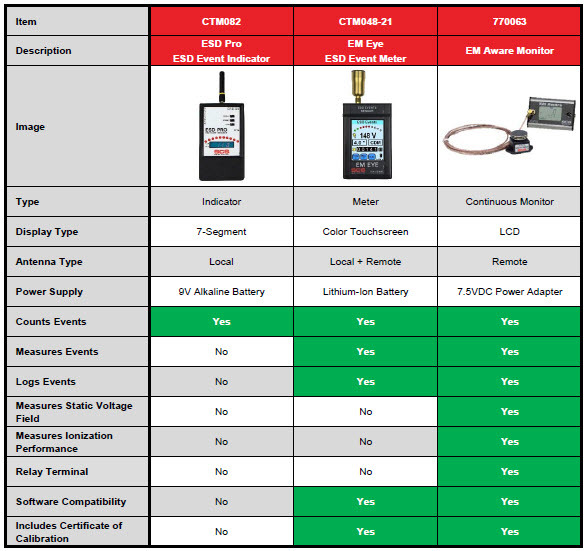 Visit Q Source’s SCS ESD Event Detection Promo Page for information about, and to purchase, these important diagnostic tools. You may also contact us via email or phone (800-966-6020) for large orders or other inquiries. We also offer live chat customer service on our Web site.